Not only did revenue beat estimates, it also grew 75% compared to Q4 2014. Full year revenue in 2014 reached $1.4 billion. That was an increase of 41%. Gross margins came in at 48%. The firm had previously set a margin range of 43.5% to 44.5%. What drove revenue through the holiday shopping season was GoPro's newest camera, the Hero4. GoPro released it in September, which also helped Q3 sales. During the fourth quarter, GoPro shipped 2.4 million devices. For the full year, total shipments reached 5.2 million. The company has also been driving customers to its app. Downloads of the GoPro app exceeded 2.8 million in the quarter. Now more than 13 million people have downloaded the app total. Following the bullish report, GPRO stock jumped 13% in after-hours trading. After last quarter's earnings, GoPro stock jumped 13% when the company beat expectations and raised guidance figures. This is the third straight strong earnings report for GoPro since going public. 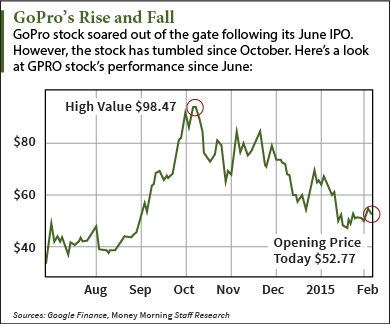 In its previous two earnings reports, GPRO beat expectations by an average of 41.6%. And it looks like investors expected today's strong numbers. GPRO stock finished Thursday up 4.9% before the earnings report.